Home » Gallery » 2.16. Harriet Alfarata Chapman. Harriet Alfarata Chapman. Tintype. Album 2. Page 16. 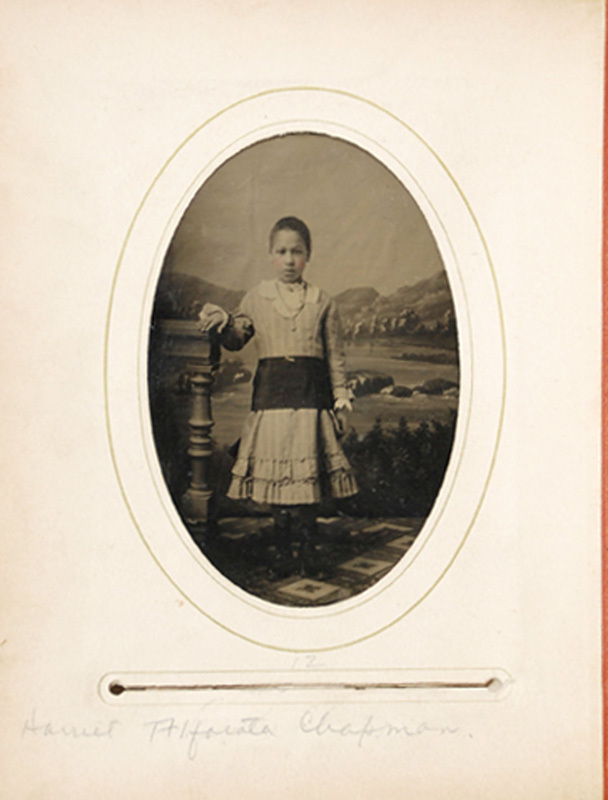 Twelve years separated Arabella from her younger sister Harriet Alfarata. The two were raised together in their parents’ Albany home until Arabella’s marriage in 1886. In 1890, The New York Age reported that Alfarata had entered a school of stenography and typewriting, and would go on to a career as a stenographer with the public library. She married John W. Thompson though when and where we know. Harriet Afarata died in June 1922 at just 51 years old of breast cancer. Alfarata left behind a utopian novel titled Idealia, a Utopian dream, or, Resthaven that was published posthumously in 1923 by J.B. Lyon in Albany. Carol Farley Kessler described Idealia as “A woman visits a community–for the elderly, the orphaned, the invalid–modelled after a resort. Its male director explains special features–wheeltables, parlorettes, and social activities. Communitarian alternative present.” [Carol Farley Kessler, “Bibliography of Utopian Fiction by United States Women 1836-1988,” Utopian Studies 1, no. 1 (1990): 1-58.] Perhaps Alfarata drew upon what she knew of the hotel and resort culture of Albany and Saratoga Springs as she developed the novel’s setting. 2.16. Harriet Alfarata Chapman. Tintype. 1.27. 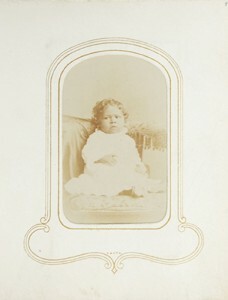 Baby in white dress.